Today and tomorrow both high end and low end Easter Chocolate is on sale at 50% off. This is the perfect time to scoop up the bargains. But maybe you still have some leftover chocolate at home? 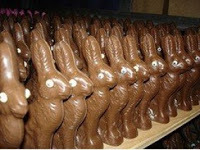 Perhaps not the ears of the bunny, but body parts and decimated eggs? Put all that chocolate to tasty use! If it's still in its wrapping, donate leftover chocolate to homeless shelters -- or if it won't melt, ship overseas to military personnel. But if your chocolate is in pieces and chunks, here are a few ideas. Leftover chocolate goes great on ice cream or added to brownies and cookies. 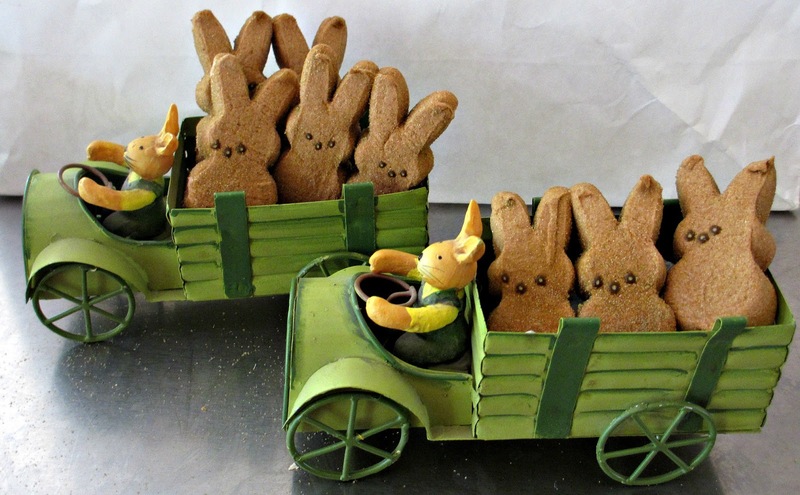 So many creative ways to re-purpose and re-savor Easter Candy. Feel free to add your own leftover Easter chocolate ideas! Freeze for Later: Chop up chocolate bunnies and chocolate eggs. Freeze the pieces and use instead of chocolate chips in cookies and other goodies. Ice Cream: Melt Easter bunny parts and pour over ice cream. Add some nuts. Or just chop it up and sprinkle on ice cream. Add berries and whipped cream for a great sundae. Milk Shake: Use any chopped chocolate with two scoops of ice cream and some milk. Blend! S'Mores: Well they're a natural with Peeps, especially the chocolate covered ones.. but in a pinch add some chocolate bunny, a peep, a graham cracker, and put in the oven or microwave. Add another graham cracker and you're good to go! Trail Mix: Well, duh... chop up the chocolate and add some dried fruit and nuts. I think a chopped up chocolate coconut egg would be a great addition, too! Put it in a small baggie and go for a hike! Chocolate Covered Strawberries: Instead of dipping (unless you have a lot of chocolate), drizzle melted chocolate over fresh strawberries. Candy from Candy: Melt Chocolate Bunnies or Easter eggs in double boiler or microwave. Once chocolate is hot and smooth, pour into candy molds. Chocolate Fondue: see my fondue recipes. The Bunny has never tasted so good... Retro treat with Retro Chocolate. Dip leftover PEEPS and fruit. Hot Chocolate: Melt some chocolate. Add water or milk and heat until perfect. Add some whipped cream (or a PEEP)! Brownies: I always add some extra chopped chocolate to my brownies, so why not some Chocolate Easter Eggs? Chop and fold into batter. Pancakes: Make a batch of pancakes and drop some chocolate in (do it toward the end or the chocolate or chocolate will scorch) or melt some chocolate and use in place of syrup. Muffins and Waffles: Chop up Chocolate and add to muffins or waffles. Trifle: Layer chopped Bunnies with leftover cake or brownies, whipped cream, cookie crumbs and anything else that seems yummy to you. I like to make trifles in clear glass containers to see all the layers of delicious chocolate goodness! Cookies: Do I really need to tell you how to do this? Chop and Drop in your favorite batter! Cupcakes: Any way you'd use chocolate -- or use an apple corer and fill the centers. Rice Krispies Treats: Melt chocolate, then stir in Rice Krispies. Spread on a tray. Put in Refrigerator. Cut. Any other ideas for left-over Easter Chocolate? Celebrate National Park Week 2019 from April 20 to 28! Parks across the country will host a variety of special programs and events. Special days during the week to highlight the different ways you can enjoy your national parks. 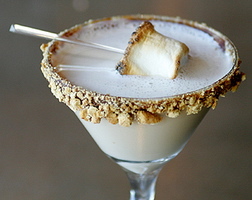 So what could be better to toast National Park Week than a S'mores Martini? Here are two recipes for an adult version of S'mores: S'mores Martinis. Just a bit of history. If you're not familiar with s'mores, they're made by sandwiching a toasted marshmallow and a piece of chocolate in between two graham crackers. The name S'mores (alternatively Smores) comes from the two words "some more," because everyone always want s'more. This American treat was developed by the Girl Scouts in the early part of the 20th century, making use of the newly mass-produced marshmallow. Marshmallows were easy to transport, as were candy bars and graham crackers, and the marshmallows could be toasted over a fire to make a fabulous campfire treat in a situation where other types of sweets would have been difficult to come by. Of course, the quality of the chocolate and marshmallow, and even the graham crackers (if you make your own) will vary, but S'mores aren't about haute cuisine, at least not at my house. So this week in honor of our National Parks, Drink Your S'mores! Both S'mores Martini recipes make four glasses. First recipe adapted from MyFind. Second recipe adapted from the Evite Blog. Let me know which you like best! 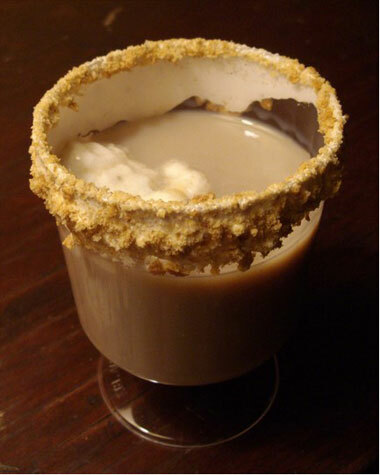 Dip rim of 4 martini glasses in chocolate syrup and then into crushed graham crackers. Chill glasses in freezer. Pour all remaining ingredients except marshmallows into martini shaker filled with ice and shake until well blended. Strain and pour into chilled glasses. Skewer toasted marshmallows on cocktail stick and place across rim. Pour vodka and chocolate liqueur into pitcher and stir. Refrigerate for several hours until mixture is very cold. Put crushed graham crackers in small bowl. Lightly coat rims of martini glasses with marshmallow creme (marshmallow fluff). Dip each glass into bowl of graham cracker crumbs. Shake bowl gently to cover marshmallow creme with crumbs. Put prepared glasses in freezer. Skewer and Toast marshmallows over open fire or with kitchen blowtorch. Pour drink mixture into 4 prepared glasses. Add skewered toasted marshmallows for garnish. 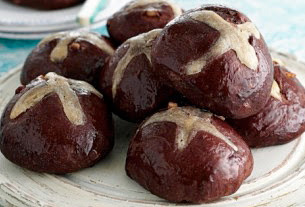 A few years ago Jo Pratt posted this recipe for Chocolate Orange Hot Cross Buns - an Easter Recipe -- on the Mailonline. If you want to make hot cross buns and add chocolate without making a chocolate bun, you can make regular hot cross buns and add chocolate chips instead of raisins. But give this one a try. I've converted the measurements from the U.K. to the U.S. If you want to check out the original recipe with UK measurements, go HERE. Makes 12 buns. Place milk in saucepan over low heat. Just before it boils, remove from heat and stir in sugar and butter, until dissolved. Add 1/4 cold water and leave to cool down until you can comfortably hold your finger in it for a few seconds. Sift together flour, cocoa, mixed spice (if you're using it), and salt in large bowl and stir in mixed peel, orange zest, and yeast. Make a well in center and pour in warm milk mixture and beaten egg. Mix together until you have a sticky dough. Add chocolate chips or chopped chocolate, and knead on a floured surface for 8-10 minutes until smooth and elastic. Place dough in large, lightly oiled bowl, cover with damp tea towel and leave to rise in warm place for about 1 hour, or until doubled in volume. Punch dough and knead for a couple of minutes. Divide into 12 pieces and shape into buns. Place on greased baking sheets, leaving enough space between each for rising. Cover with tea towel and leave to rise again until doubled in size – about 30 minutes. Preheat oven to 400 F.
For glaze, mix flour and oil with 2-3 Tbsp water until smooth. Lightly cut cross in center of each of buns with knife to mark out your crosses. Using piping bag (or plastic bag with corner snipped off), pipe on crosses. Cook buns for 15-18 minutes until golden and sound hollow when tapped underneath. Place orange juice and sugar in small pan, and gently heat until sugar dissolves. As soon as buns are out of oven, brush with glaze and leave to cool slightly on wire rack before serving warm. Of all my childhood Spring Confection memories, PEEPS stand out. My sister and I still buy each other PEEPS around Easter, although she rarely eats the sugary marshmallow-y creatures any more. She buys me purple rabbits; I buy her classic yellow chicks --the original PEEPS. You see where this is going? I'm a purist, but since this is a Chocolate Blog, I've made room in my Easter PEEPS inventory for Chocolate PEEPS. So, PEEPS: You either love them or hate them. People do all sorts of things with PEEPS, only some of which involve giving them to kids at Easter or eating them straight from the box. For me, it's the elastic quality of the "old" PEEPS that's fun for me--pulling them apart. Chocolate: The ultimate in the ever improving PEEPS. Chocolate-Covered PEEPS are available from the original company in both Dark and Milk chocolate. These are not the small peeps packed together in rows. No, these Chocolate Peeps come in individually wrapped packages, as well as in a three pack. Sadly, in the big ones, the cool sparkly coating of sugar is missing, and I think it would have been a nice buffer between the chocolate and marshmallow to make it stand out from the rest of the chocolate marshmallow candy. However, the Chocolate Dipped PEEPS do have the sugar. I love the three pack of PEEPS Chocolate Dipped Chicks (both dark and milk chocolate), as well as the Dark and Milk Chocolate PEEPS Chocolate Dipped Mousse Flavored Marshmallow Chicks! I'm a fan of Chocolate Eggs, and PEEPS has a very fun individually boxed hollow milk chocolate egg with a PEEP chick inside. Maybe it's been around for awhile, but I missed it. LOL! And, just as an aside, Jacques Torres makes fabulous chocolate, and they sell Chocolate-Covered PEEPS. Their name: Chirp'N'Dales. They are adorable. Also, Asher's Chocolates makes Milk and Dark Chocolate Dipped PEEPS. 1. Make PEEPS S'Mores, especially with the chocolate covered ones. 2. Plop a Chocolate Covered PEEPS down in your Hot Chocolate or Coffee. 3. Decorate cakes or cupcakes with PEEPS. 4. Create Your Own PEEPS Diorama. 5. Bake PEEPS in your brownies! 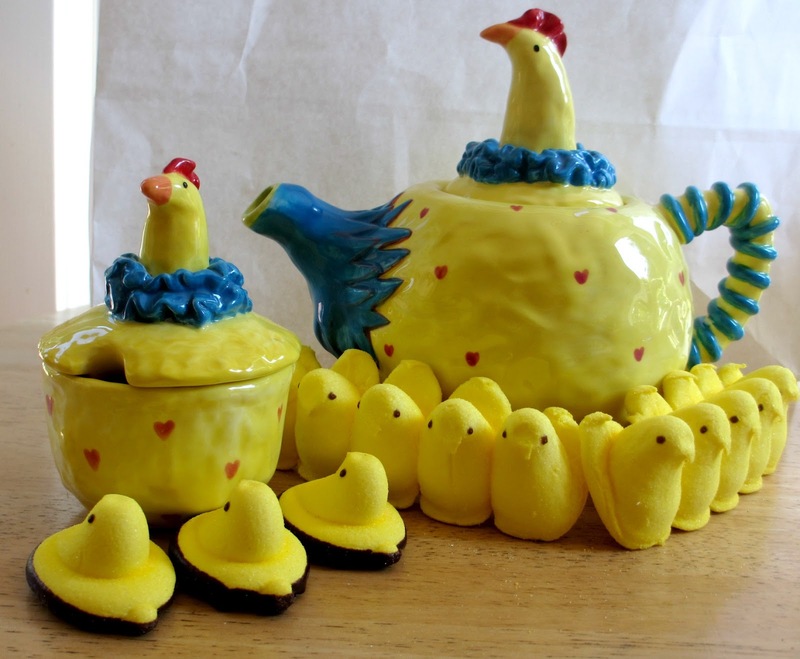 Want to make your own Chocolate Covered PEEPS using the original PEEPS? 2. Remove Peeps from package. I would use Chicks since they're the original, but the other shapes (rabbits, etc) work well. 3. Insert a lollipop stick into the Peep. If you're using the chicks, do it the widest way (maybe this is why they're sideways standing up in the packaged ones--and why bunnies work better). 4. 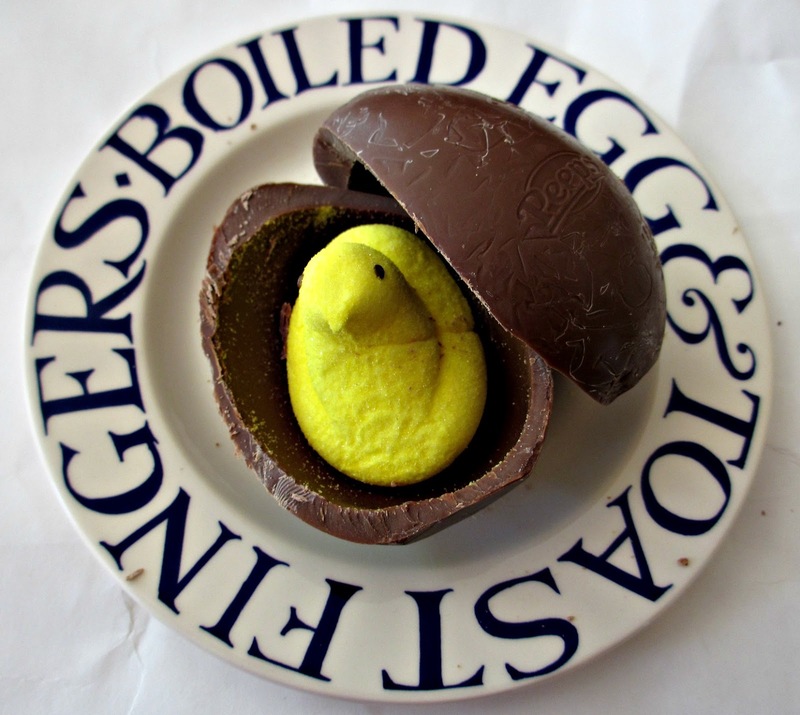 Dip the Peep into the melted chocolate. Two choices: Either cover the entire Peep or just dip one end as you would strawberries. Be sure and let any excess drip off. 5. Put on wax paper covered plate or cookie sheet and freeze for 20 minutes. Question? 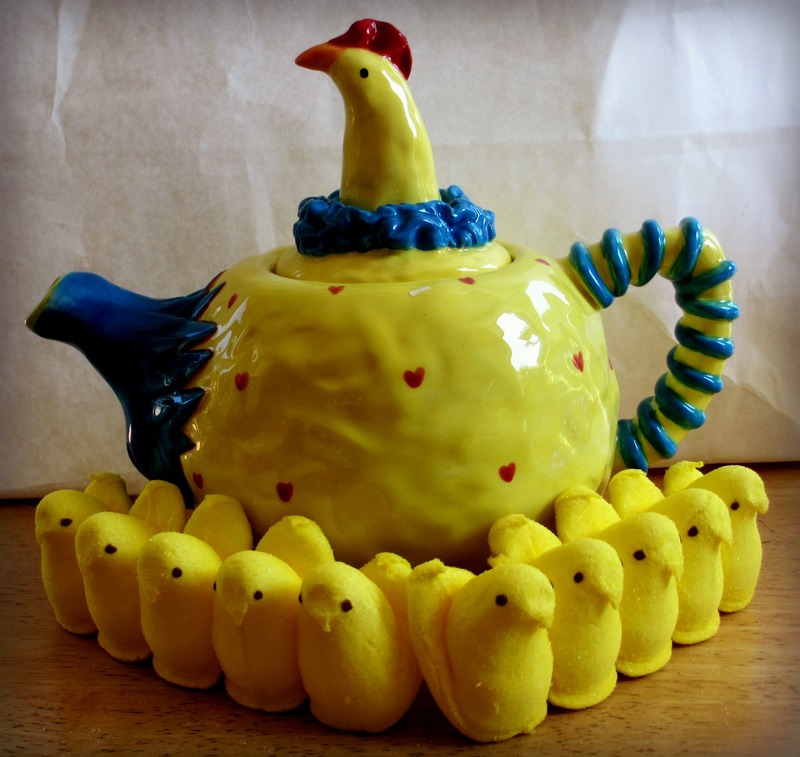 When is a PEEP, not a PEEP? When it's Chocolate-Covered. Chocolate Dipped Peeps complete the flock!